I am beginning an extremely non-scientific study into the use of tweed to denote Englishmen in American film and TV. Every time I see an Englishman in tweed in an American production, it will find its way here. This was inspired partly by Giles in Buffy the Vampire Slayer (who almost always wears tweed) and partly because we watched a truly dreadful film last night, and the lasting impression that we took from it was: Americans use tweed to denote an Englishman. 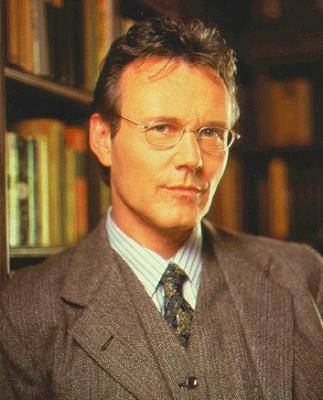 Rupert Giles. He’s wearing tweed in almost every photo on the internet. True fact. The film we watched last night was dire. Red Lights, in case you’re wondering. It started as a formulaic jumpy paranormal film, then slid into something much more interesting (although I didn’t care about any of the shallow characters) and then committed suicide disappointingly at the end. Plus, there was a really obvious twist. But I digress: it was clear, from this film and from other American productions, that Americans use tweed to identify Englishmen. I’ve had a quick search for the scene in question, but I can’t find it. It’s when all the reporters are clamouring around the scientists (I think). One of them is English. He’s wearing tweed. Spotted any uses of tweed in American film and TV? Let me know. I’ll document them here. It’ll be thrilling. This entry was posted in Random rambling, Woe and tagged American film, buffy the vampire slayer, cillian murphy, clothing, Englishman, entertainment, Giles, paranormal, red lights, robert de niro, sigourney weaver, TV, tweed. Bookmark the permalink. Tweed’s awesome. I have nothing against tweed. It’s splendid stuff, especially on handsome men. It’s just I’ve never come across it used as a tool before. Surely the true sign of Englishness in American media is ‘evil’, rather than ‘tweed’? When I foolishly subjected myself to The Da Vinci Code, the instant Prof Teabing was described as having an upper class English accent, I said to myself, “Aha! I have found my villain!” Dan Brown – anticipated. Maybe in the old days, JD. Now, the sign of Englishness is tweed. I will prove it empirically and unquestionably.